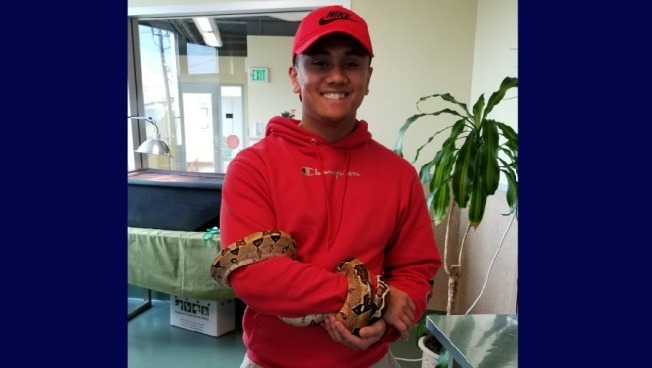 "Rocky Balboa," a boa constrictor with a broken jaw found on Highway 92 in Burlingame in October, has found a home - and a main squeeze, a spokeswoman for the Peninsula Humane Society and Society for the Prevention of Cruelty to Animals said. It was touch and go at first for the snake, who couldn't eat due to a severely swollen and broken jaw, according to spokeswoman Buffy Martin Tarbox. "Without treatment, this is a certain death sentence," Tarbox said. "We weren't sure she was going to make it." The Humane Society's veterinarians splinted the jaw and gave the snake pain medicine and antibiotics, according to Tarbox. The boa constrictor rallied, and after a few weeks she was able to eat on her own. In response, the staff named her "Rocky Balboa" as a nod to the fictional male boxer who overcame huge odds, not to mention the implicit pun. "Despite what she's been through, she's extremely friendly and outgoing," Tarbox said. "She really likes to be held. When snakes are comfortable with someone, they wind their bodies around them." The spokeswoman elaborated, "Not in a menacing way." Roman Nava of Castro Valley showed up first thing Thursday to adopt Rocky. The snake took to Nava immediately, curling up in his arms, Tarbox said. She noted, "He's an experienced snake owner."